Cash or points? It’s a tough decision when going in for a rewards credit card, but there’s no denying that cash back credit cards are hard to pass up, since they give back a percentage of your eligible purchases in real dollars. Think about what you could do with the amount of cash back you receive, like invest it into a high-interest savings account, pay down debt, build an emergency fund, or use it towards another purchase. Your options to redeem rewards are many, and so are the types of cash back credit cards on the market. You’ll typically find cash back rates of anywhere from 1% to 5%, based on the particular card. Depending on the card you choose the available cash back credit cards may also offer a bonus for qualifying new Cardmembers, or an introductory Annual Percentage Rate (APR) offer along with the various terms and conditions to consider for each card. Then, too, it would be helpful to know which cards are suggested for certain credit scores, and what your score is before applying. Keep in mind that credit scores are just one factor that credit card issuers use to assess your eligibility for a credit card. Just because your credit score is in a particular range does not guarantee you will be approved for a credit card. Credit card issuers use a variety of different types of credit scores and other criteria to make credit decisions. Which card is right for you? Keep reading for our picks on the best cash back rewards credit cards and you may see one that closely matches your spending habits and that is a fit for you. What credit score is needed for a cash back credit card? An excellent credit score (720 and above on the FICO® Credit Score chart) may help to increase your chances for approval for the best rewards card at the lowest interest rates. Consumers with good credit scores (640-719) also have a chance at obtaining the cash back card they want, since positive credit behavior may indicate a better score to come. 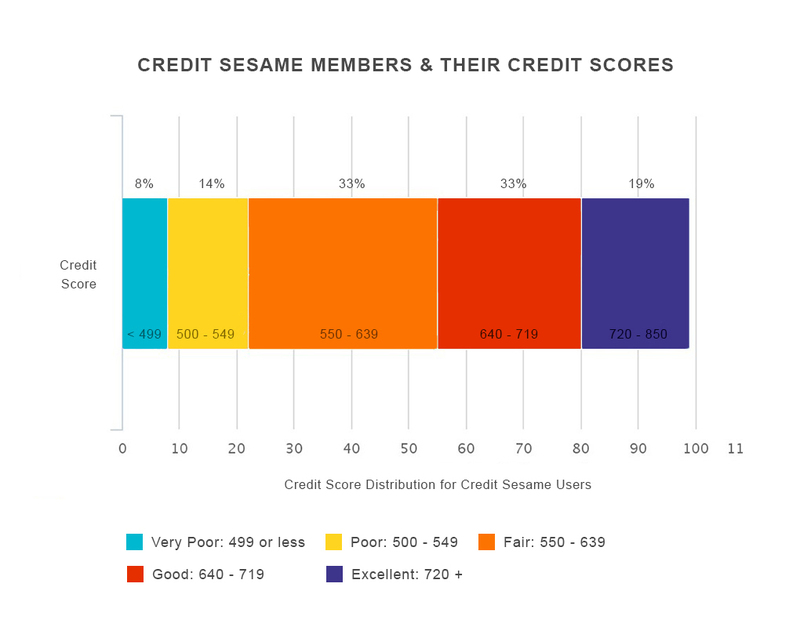 This is good news for Credit Sesame members looking to open a new cash back card, since nearly half of our members have credit scores in the good to excellent range. This is a chart that shows the average credit scores, taken from a subset of Credit Sesame’s 7 million members collected October 2015. The Chase Freedom® credit card’s bonus categories changes each quarter, making it a good choice for earning cash back in specific spending categories at certain times of the year. 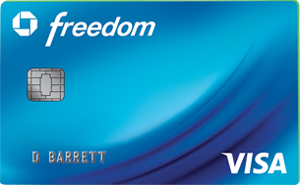 The Chase Freedom® card can benefit Cardmembers who tend to spend regularly in the card’s bonus categories. But those bonus categories change quarterly, so you won’t receive the highest rewards on every category all year round. This card has a foreign transaction fee of 3% of each transaction in U.S. dollars. There’s no annual fee for this card. There are a few features that, in our opinion, make the Discover it® Cash Back card the “it” piece of plastic in your wallet. With Discover it® Cash Back earn 5% cash back at different places each quarter like gas stations, grocery stores, restaurants, Amazon.com and more up to the quarterly maximum, each time you activate. Plus, automatically earn unlimited 1% cash back on all other purchases. We think one of the nicest perks on this card is an intro offer where Discover will match all the cash back you’ve earned at the end of your first year, automatically, for new cardmembers only. There’s no signing up and no limit to how much is matched. There is an introductory offer: Discover will match all the cash back you’ve earned at the end of your first year, automatically – for new cardmembers only. There’s no signing up and there’s no limit to how much is matched. 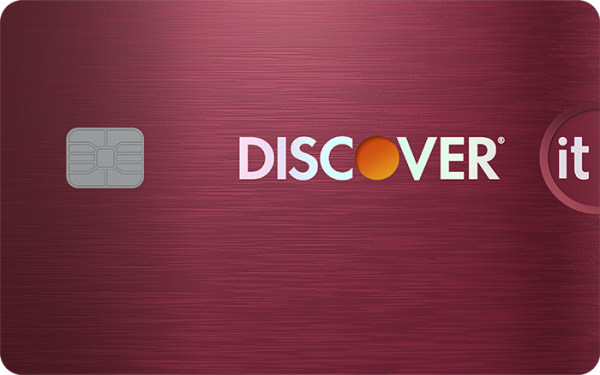 The Discover it® Cash Back card has no annual fee, which is also a plus. The Walmart® Credit Card is indispensable if you’re a frequent visitor to the discount retailer’s online and brick-and-mortar stores. Use the card to save on eligible purchases: Save 3% back on Walmart.com purchases (includes Walmart Grocery Pickup purchases); 2% for gas purchases at Walmart fuel stations and Murphy USA gas stations; and 1% at Walmart and anywhere the Walmart® Credit Card or the Walmart® Mastercard® is accepted. Some exclusions apply. The savings are paid as a statement credit. 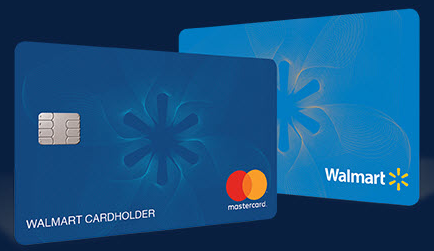 You can choose between the Walmart® store credit card or the Walmart® Mastercard® to enjoy the benefits of the 3-2-1 cash back rewards program. There is a limited time offer where new cardholders who open a Walmart Credit Card can save $25 when you spend at least $75 on your first qualifying purchase made the same day the account is opened, subject to credit approval. This offer cannot be combined with any other offer, and purchases are not eligible for cash back rewards. The savings are paid as a statement credit. The account opening offer may vary by store or online. Save 3% on Walmart.com purchases, 2% on Murphy USA and Walmart® gas, and 1% on purchases at Walmart and wherever the card is accepted. Savings are paid as a statement credit. The Walmart® Credit Card may interest those who frequently shop at the discount retailer’s stores and who are looking to save on Walmart purchases. 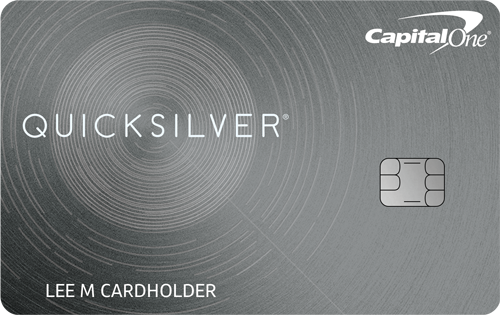 The Capital One® Quicksilver® Cash Rewards Credit Card offers a simple straightforward cash back program. It does not have an annual fee, pays a straight unlimited 1.5% cash back on every purchase. There are no rotating categories or sign ups needed to earn cash rewards; plus, cash back won’t expire for the life of the account and there’s no limit to how much you can earn. The Capital One® Quicksilver® Cash Rewards Credit Card offers a one-time cash bonus of $150 after you spend $500 on purchases with your card within 3 months from account opening. It’s a good simple card, with no hassle or sign-ups needed. The Capital One® Quicksilver® Cash Rewards Credit Card may be a good choice for people who want a cash back rewards program with no rotating categories or sign ups needed to earn cash rewards and no annual fee. The Citizens Bank Cash Back Plus® World Mastercard® credit card has no annual fee and no foreign transaction fees. Earn unlimited 1.8% cash back on every eligible purchase with no rotating categories or sign-ups. There’s no limit to the rewards you can earn and points won’t expire as long as your account is in good standing and you make an eligible purchase once every 12 months. If you sign up for one or more cards, consider one of these for the rewards they offer that can translate to cash in your pocket. Examine your typical spending first, and choose the card that offers the greatest reward for the purchases you are already likely to make. Here are a few other tips you may find helpful when considering a card. If the card has an annual fee consider if it makes sense to own the card, meaning do the features and perks of the card even out or outweigh the cost of the annual fee. If you tend to carry a balance pay attention to the Annual Percentage Rates (APR’s). Once you decide on a card be sure to manage your account responsibly such as making sure to make all your payments are received on-time. Stay within your means, don’t use the card as a reason to spend more just to earn rewards. Use your cash back refund wisely, invest it into a high-interest deposit account, pay off debt or use it towards future purchases that, with card in hand, earn you more cash back with smart use. If you’re interested in cash back credit cards you can learn more and view credit card offers from our partners – click here. Independent Review Disclosure: All the information about the Walmart® store credit card, Walmart® Mastercard® and the Citizens Bank Cash Back Plus® World Mastercard® credit card has been collected independently by CreditSesame.com and has not been reviewed or provided by the issuers of these cards. The Walmart® store credit card, Walmart® Mastercard® and the Citizens Bank Cash Back Plus® World Mastercard® credit cards are not available through CreditSesame.com.